Rivers remained a useful means of transport after Europeans settled in the King Country, particularly in the early years when roads were rudimentary or non-existent. 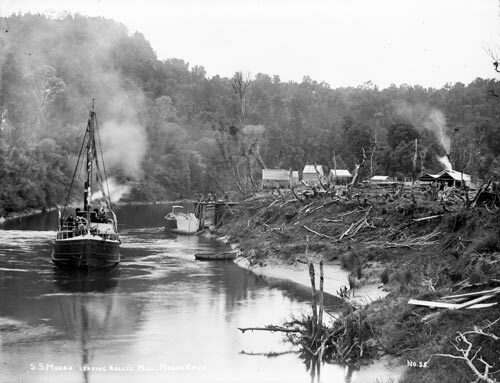 This is the SS Mokau leaving a sawmill on the banks of the Mōkau River around 1908. Steamships like this would have dropped off supplies to the camps at sawmills and coal mines along the river and picked up bulk items – coal and timber – to transport to larger centres.